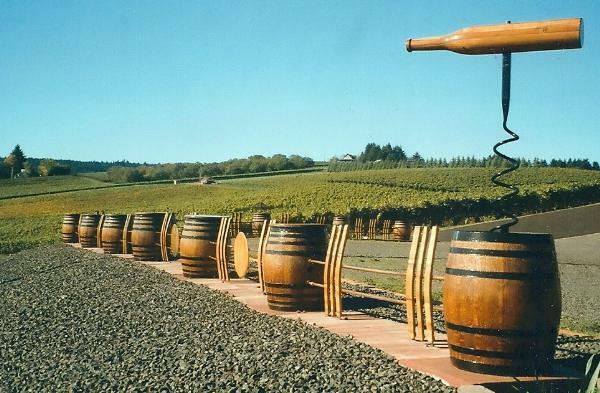 Yes, there is a fence made from recycled French Oak Barrels. Barrel Fence Cellars produces "Estate" Pinot Noir from both Oregon's Willamette Valley and Central Otago. Our NZ wines are sold only at the Barrel Fence cellar door in Dundee, Oregon. Herb and Eleanor Sims planted their 4.5ac Gibbston vineyard in 2002, and farm 8 acres of Pinot in Oregon. The Gibbston vineyard is located near 45th Latitude South, and Oregon vineyard near 45th Latitude North. Hence, "Two Worlds of Pinot Noir". Wines are sold under matching labels, Barrel Fence Cellars "45 North" and "45 South".